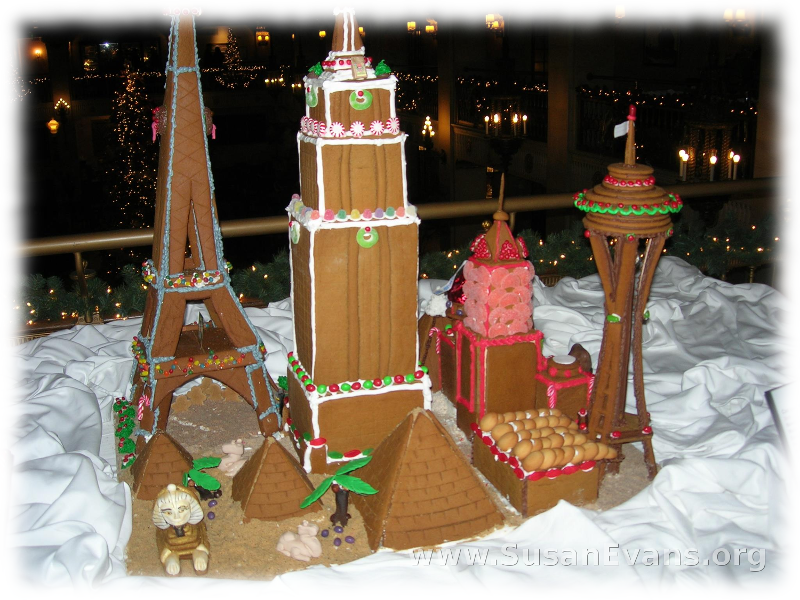 Look at these deluxe gingerbread houses! 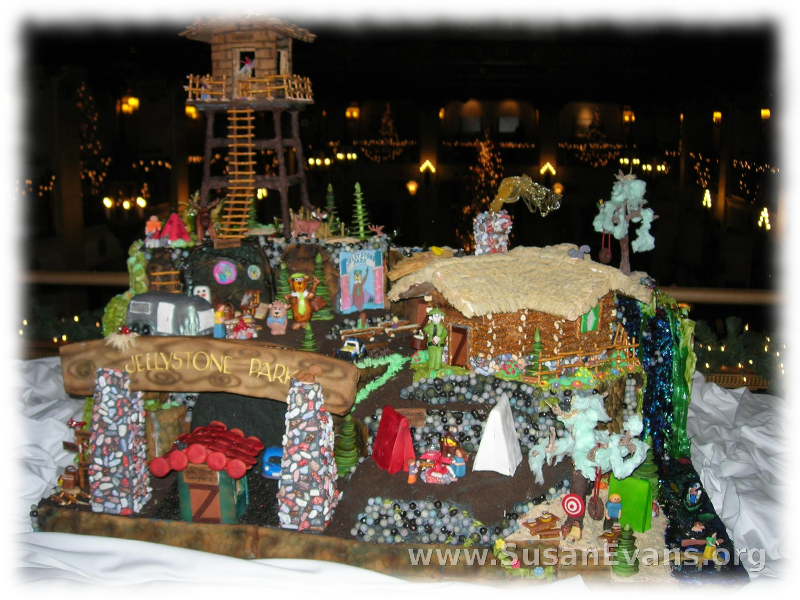 It’s incredible what people can build out of gingerbread, frosting, pretzels, and candy. 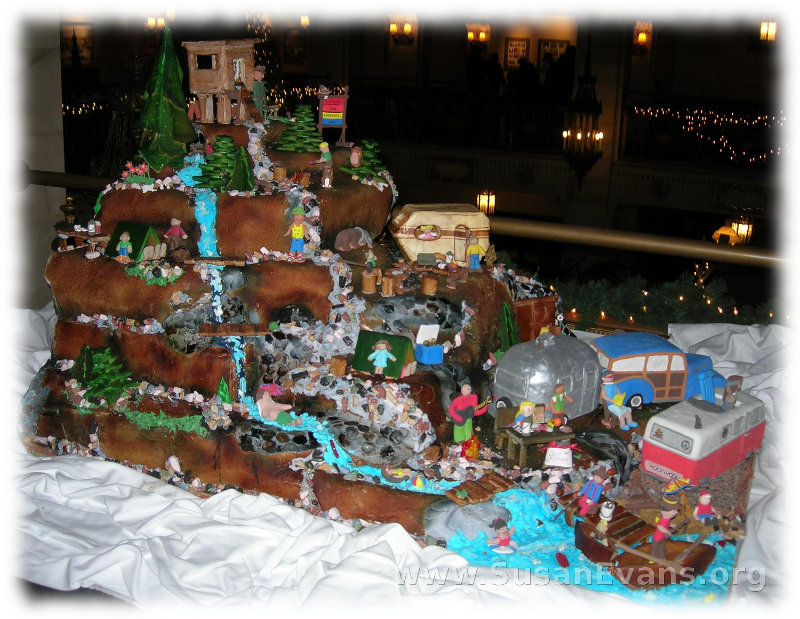 Every year there is a gingerbread house competition at the Davenport Hotel in downtown Spokane, WA, and every year I’m impressed. If you look at the first picture, there is a treehouse structure with a pretzel rope ladder. There must be some form of candy that looks like rocks, because it was used to build a lot of this scene. The sign says “Jellystone Park,” and Yogi Bear is included in the scene. A pretzel cabin and a camping area with tents rounds out the scene. This one is obviously about famous landmarks. 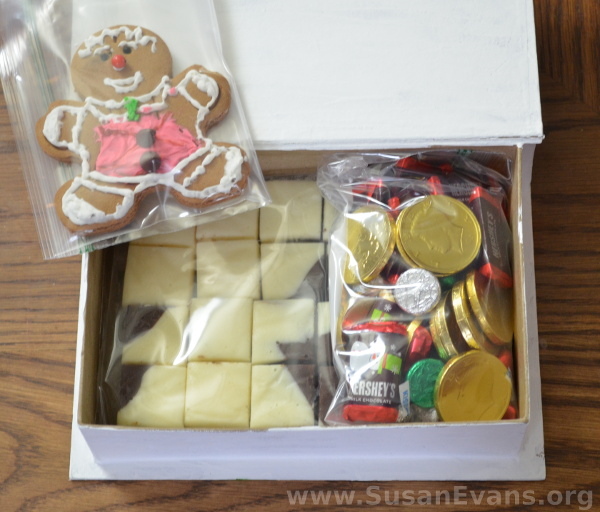 They used mainly plain gingerbread, with frosting and candy embellishments. The sand at the bottom of the pyramids is undoubtedly crushed graham crackers. This is a nice gingerbread house. The roof is covered with mini-marshmallows, as well as the snowy ground. 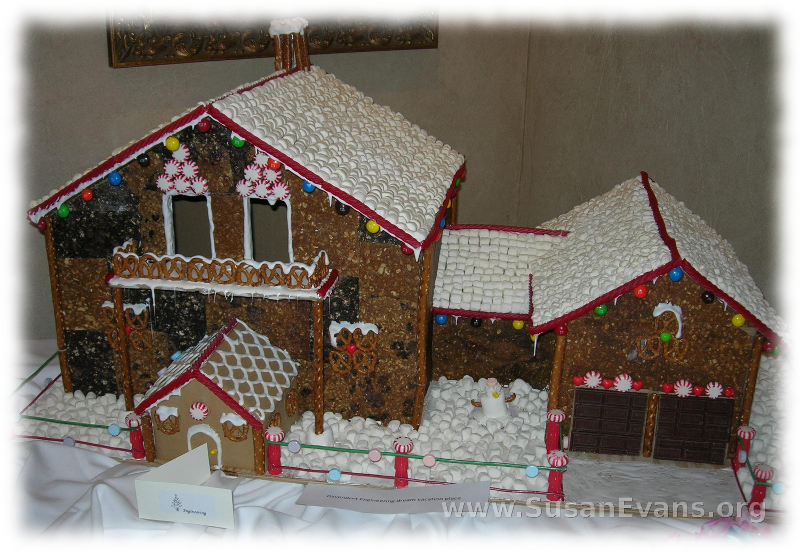 Chocolate garage doors, pretzel embellishments, and a shoelace licorice candy fence surrounds the scene. This waterfall scene is so extravagant that its ingredients are out of my league. I think fondant was used, and I hear it is difficult to work with. Nevertheless, it is a gorgeous scene! Okay, this one is more manageable by real humans. 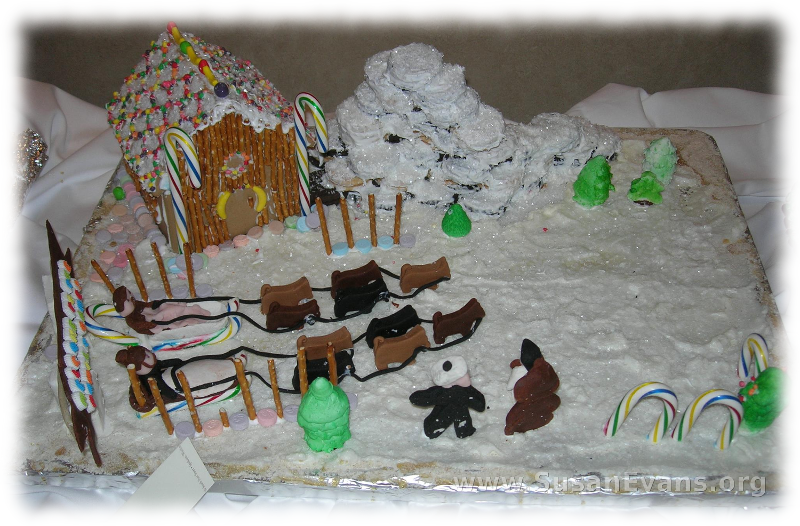 The snowy scene incudes two dog sleds with dogs, a regular gingerbread house with pretzels for logs, and white frosting covering the ground and Oreo cookies for a hill in the background. This scene is fun. It has a pick-up truck driving up a ramp to the cabin. Even though there is snow on the ground, there is greenery around the house, probably shaped out of fondant. 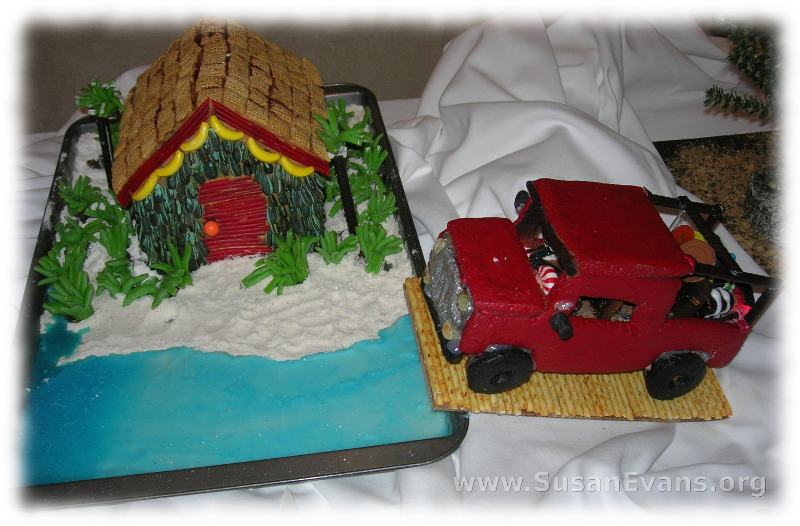 It looks like the basic structure of the pick-up truck is made out of graham crackers, covered by fondant. Here is another scene that is ridiculously complicated and impossible for mere humans like us to attempt. 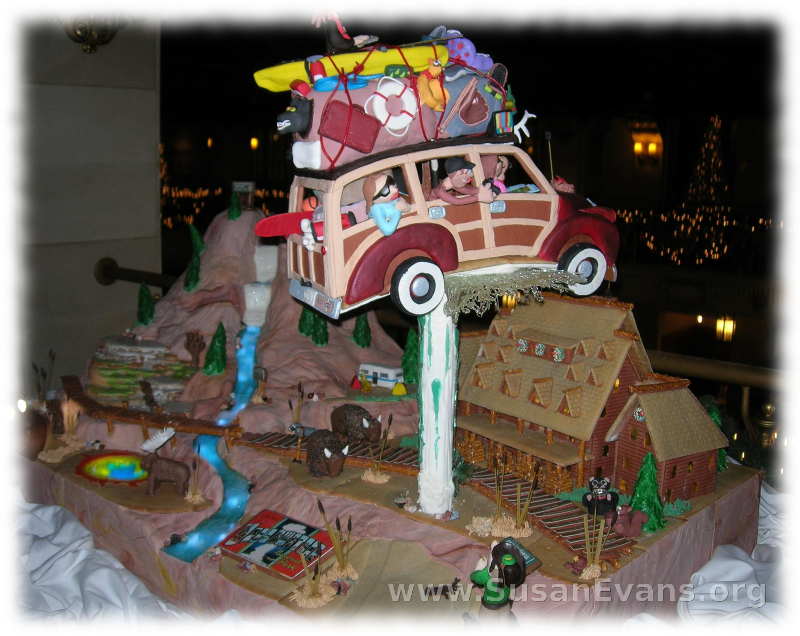 I’m sure the creator of this one is an expert with fondant because the car that is in the air is a masterpiece of perfection! Twig Frame: Hot glue twigs to a frame. Gorgeous and simple. Make sure to choose a picture to put into the frame. Clock: Make your own clock by getting the parts at a craft store. Stain or paint the wood, drill a hole for the clock parts to be mounted, and decorate. Bottle Cap Magnets: Cut circles of paper and decorate them with markers. Glue into bottle caps, and put magnet backing on them. Pottery: Get some self-hardening clay and a toy pottery wheel, and make some pottery. Basket: Purchase a basket-making kit and weave a basket. Decorated Candle: Glue tissue paper onto a jar with a candle inside. Box of Homemade Cards: Have children decorate homemade cards with card stock paper, cloth fragments, glue, and markers. Soap Shapes: Use a cookie cutter to make soap shapes. Shape Books: Create shape books for younger brothers and sisters with paper, a stapler, and construction paper. Pop Bottle Bird Feeder: Make this simple bird feeder with a pop bottle for the bird lovers in your family. 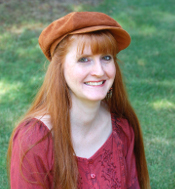 Crazy Hat: Decorate a crazy hat for a younger sibling. Costume: Make a simple Bible costume, Egyptian costume, Greek costume, or Roman costume to give away as a gift to someone who enjoys theater. 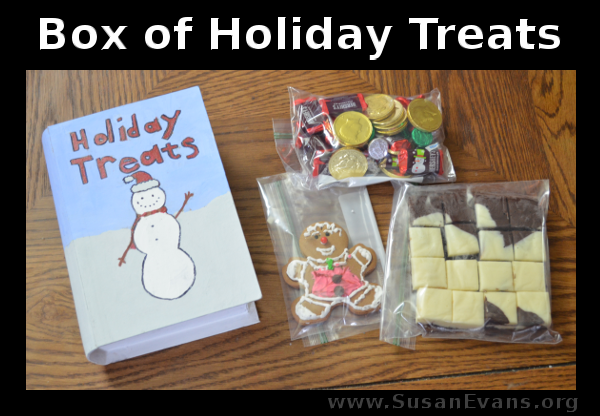 Embossed ornaments: Make some embossed ornaments with an embossing kit. Here are some tips for success in embossing. Roman Coins: Make Roman coins for someone who likes that time period. Clay Sculpture: Sculpt a shape out of clay that will delight the recipient. 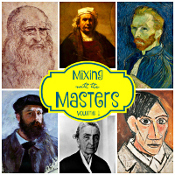 Sculpt a fish for a fisherman, an apple for a teacher, or a pie for a baker. Coat of Arms: This would be for older children to sew, or you can have younger children glue felt shapes onto a shield shape. Toy Trebuchet: Get a toy trebuchet kit and have your child put it together for a younger sibling. DVD of a Puppet Show: Have your child write and perform a puppet show, using the video camera on the computer. Burn the show onto a DVD and give it to a younger sibling or to Grandma. Cross Mosaic: Get an unfinished wooden cross from a craft store and glue tiles onto it. Great as a wall hanging. Canvas Bag: Decorate a plain canvas bag by sewing embellishments on it or making a design with fabric markers. 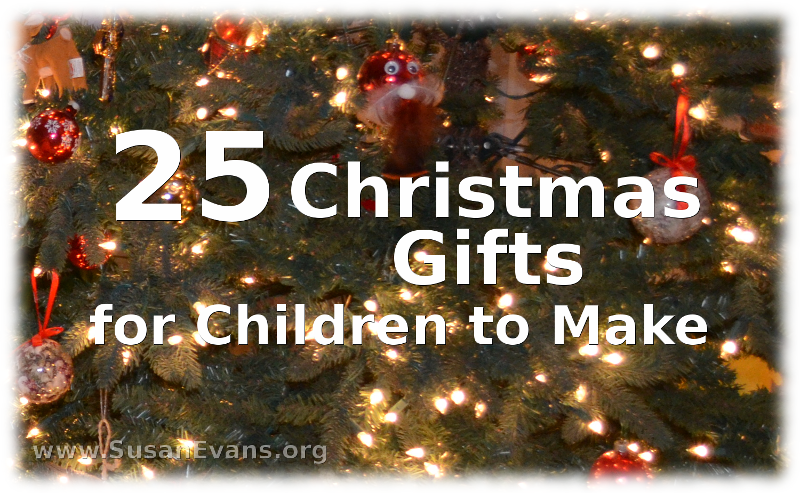 Decorated Ornaments: Make faces on regular Christmas balls with any crafts supplies lying around your house. These look goofy! Box of Snowflake Cards: Make a box of snowflake cards by poking holes and sewing white yarn into black card stock paper. 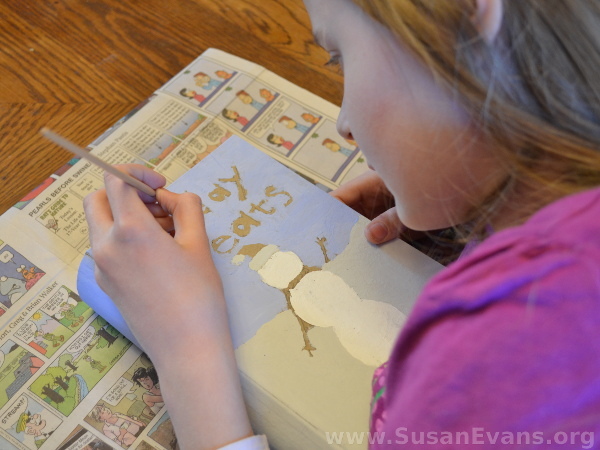 Framed Textured Art: Create textured art by gluing pieces of fabric together to form a pattern. Frame your masterpiece! 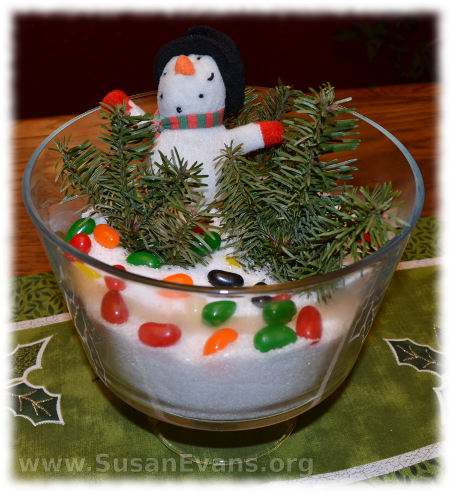 Make a beautiful snow scene centerpiece for your table in less than five minutes. All you need is rock salt (or Epsom salt), a branch of greenery, some Christmas ornaments, and a large glass bowl. Dump the rock salt into a large clear bowl in the center of your table. Rock salt looks more beautiful, but Epsom salt is more useful, since you can re-use the Epsom salt in your bath after December is over. Place some greenery into the white salt. You will need to break off small bits of a branch of an evergreen tree, or you can use shears to cut it. I stuck pieces of greenery into the “snow” so that they would look like trees in a forest. But you can also lay them flat in a beautiful way. Look at the decorations on your tree, and see if you want to showcase one ornament, or if you want to choose several ornaments. A village house would look pretty in the snow. Arrange the ornaments in your bowl. I added jelly beans for color. You could add red berries or a red garland for a similar effect. Just mess with the scene until it looks pretty. Enjoy your finished snow scene centerpiece! For more fun winter activities, click here.